Shining some light on those Tuesday ballots which are also about tax fairness. Look through this list of referendum issues on SE Wisconsin suburban ballots. Note the large number of communities asking local taxpayers to pay more for schools and cops. wherein Walker-led state government - - posing as the friend-of-the-taxpayer - - has cut shared revenue and imposed local fiscal limitations - - all of which forces grassroots officials to take the heat and local residents to come up with cash through referenda and higher local taxes. Also note the number of advisory referenda that register opposition to so-called dark-store assessment and taxation, a public policy which has needed more publicity (I have barely blogged about it, so shame on me, too) and which legislators failed to outlaw. Dark-store policies let retailers and manufacturers apply for property tax reductions using computations that reflect dark-store failures, even if the businesses seeking assessment reductions are solid, even flush, not dark. Imagine asking your local officials to cut your property tax assessment because someday you might take a salary reduction or lose your job. And when dark-store reductions are awarded, guess who picks up that slack, and whose community will have less money for schools and cops, etc.? If I'm Evers, I'm campaigning on dark stores and gerrymandering this weekend, and reminding people that these referenda and voucher costs are all due to Walker. You want those last 2-3% to get this race out of the "rigging zone" of 2-3%, Tony? That's how you do it. Connect the dots for people. Franklin at MLP is a fraud. The media that fawn over him are propaganda shills. This year, it's so obvious as every other poll has Evers up significantly and with support that essentially matched Tammy Baldwin. Franklin has to manufacture a the by oversampling older white male Republicans. An Evers lead by 2-3 percent is in Walker's wheelhouse and you can bet this means he will be declared the winner and WSJ, MJS, and all the local propaganda rags like Ripon Commonwealth, Jefferson Daily County Union, the various Lee Enterprise papers (WSJ) and Gannet/USA Today/MJS will tell us to forget about this obvious irregularity - there is not a 12%+ Baldwin voter base that is crossing over to vote for anti-LGBT, racist, and chronic liars like Trump-Kissin' Scott Walker. The media will begin this cover-up and white-wash by proclaiming Franklin is a genius. Like in 2016, they will never ask what legitimate polling/statistic methodology was used to align rigged elections that we know are vulnerable, subject to hacks, and reliant on voter disenfranchisement & gerrymandering MLP relied on to justify another stolen election. Voting early is the best choice, however, if you want to see change, please get out the vote. Ever's winning by less than 10% will be officially recorded as Walker's third term and the media is already laying the groundwork to catapult that lie with Franklin's dishonest polling leading the assault on our democracy. Much of the media is looking for ways to Proclaim that Scott Walker is the very model of supporting and aligning with Donald Trump. The Republican fundraisers, the Republican leadership and almost all of Wisconsin's media desperately needs to craft a story that says Walker is successful because he supports Donald Trump. If there is a contested Primary in 2020, Scott Walker will again abandon Wisconsin and run for president. This time he'll run on his strengths being elected 4 times in Wisconsin and being a loyal Trump Republican. Please go vote! 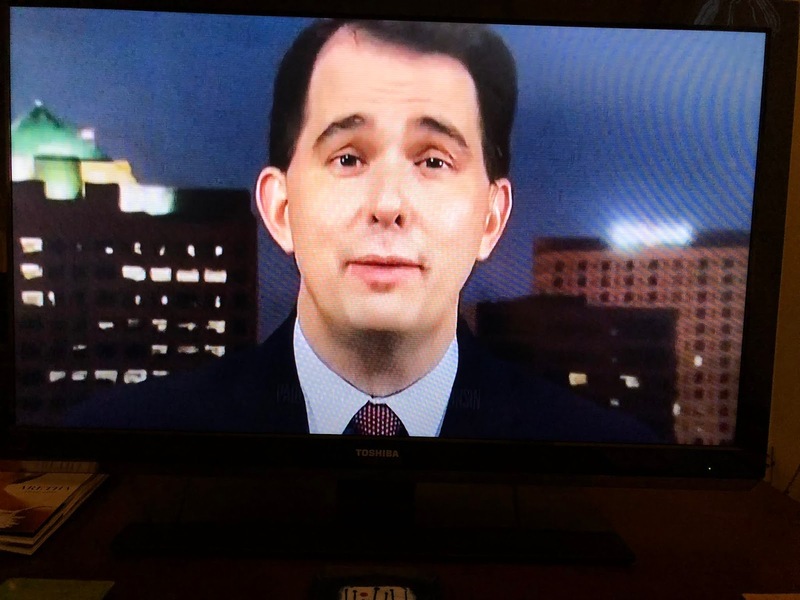 The usual players are trying to again con Wisconsin into believing that Scott Walker is all-powerful and unbeatable.